This article is about the political phrase popularized by Richard Nixon. For other uses, see Silent majority (disambiguation). The silent majority is an unspecified large group of people in a country or group who do not express their opinions publicly. The term was popularized by U.S. President Richard Nixon in a November 3, 1969, speech in which he said, "And so tonight—to you, the great silent majority of my fellow Americans—I ask for your support." In this usage it referred to those Americans who did not join in the large demonstrations against the Vietnam War at the time, who did not join in the counterculture, and who did not participate in public discourse. Nixon along with many others saw this group of Middle Americans as being overshadowed in the media by the more vocal minority. Preceding Nixon by half a century, it was employed in 1919 by Warren Harding's campaign for the 1920 presidential nomination. Before that, the phrase was used in the 19th century as a euphemism referring to all the people who have died, and others have used it before and after Nixon to refer to groups of voters in various nations of the world. The phrase had been in use for much of the 19th century to refer to the dead—the number of living people is less than the number who have died throughout human history (in 2011 there were approximately 14 dead for every living person), so the dead are the majority in that sense. Phrases such as "gone to a better world", "gone before", and "joined the silent majority" served as euphemisms for "died". In 1902, Supreme Court Justice John Marshall Harlan employed this sense of the phrase, saying in a speech that "great captains on both sides of our Civil War have long ago passed over to the silent majority, leaving the memory of their splendid courage." Whenever majorities trample upon the rights of minorities—when men are denied even the privilege of having their causes of complaint examined into—when measures, which they deem for their relief, are rejected by the despotism of a silent majority at a second reading—when such become the rules of our legislation, the Congress of this Union will no longer justly represent a republican people. In 1883, an anonymous author calling himself "A German" wrote a memorial to Léon Gambetta, published in The Contemporary Review, a British quarterly. Describing French Conservatives of the 1870s, the writer opined that "their mistake was, not in appealing to the country, but in appealing to it in behalf of a Monarchy which had yet to be defined, instead of a Republic which existed; for in the latter case they would have had the whole of that silent majority with them." In 1919, Madison Avenue advertising executive and Republican Party supporter Bruce Barton employed the term to bolster Calvin Coolidge's campaign for the 1920 Republican Presidential nomination. In Collier's magazine, Barton portrayed Coolidge as the everyman candidate: "It sometimes seems as if this great silent majority had no spokesman. But Coolidge belongs with that crowd: he lives like them, he works like them, and understands." Referring to Charles I of England, historian Veronica Wedgwood wrote this sentence in her 1955 book The King's Peace, 1637–1641: "The King in his natural optimism still believed that a silent majority in Scotland were in his favour." Also in 1955, while Nixon was serving as vice-president to Dwight D. Eisenhower, John F. Kennedy and his research assistants wrote in his book Profiles in Courage, "Some of them may have been representing the actual sentiments of the silent majority of their constituents in opposition to the screams of a vocal minority..." In January 1956, Kennedy gave Nixon an autographed copy of the book. Nixon wrote back the next day to thank him: "My time for reading has been rather limited recently, but your book is first on my list and I am looking forward to reading it with great pleasure and interest." Nixon wrote Six Crises, his response to Kennedy's book, after visiting Kennedy at the White House in April 1961. In 1967, labor leader George Meany asserted that those labor unionists (such as himself) who supported the Vietnam War were "the vast, silent majority in the nation." Meany's statement may have provided Nixon's speechwriters with the specific turn of phrase. In the months leading up to Nixon's 1969 speech, his vice-president Spiro T. Agnew said on May 9, "It is time for America's silent majority to stand up for its rights, and let us remember the American majority includes every minority. America's silent majority is bewildered by irrational protest..." Soon thereafter, journalist Theodore H. White analyzed the previous year's elections, writing "Never have America's leading cultural media, its university thinkers, its influence makers been more intrigued by experiment and change; but in no election have the mute masses more completely separated themselves from such leadership and thinking. Mr. Nixon's problem is to interpret what the silent people think, and govern the country against the grain of what its more important thinkers think." Thirty-five years later, Nixon speechwriter Pat Buchanan recalled using the phrase in a memo to the president. He explained how Nixon singled out the phrase and went on to make use of it in his speech: "We [had] used 'forgotten Americans' and 'quiet Americans' and other phrases. And in one memo I mentioned twice the phrase 'silent majority,' and it's double-underlined by Richard Nixon, and it would pop up in 1969 in that great speech that basically made his presidency." Buchanan noted that while he had written the memo that contained the phrase, "Nixon wrote that speech entirely by himself." Coincidentally, the day prior to Nixon's November 3, 1969 speech, the band Creedence Clearwater Revival released their Willy and the Poor Boys album, which contained the song "Effigy". In it, songwriter John Fogerty wrote the line, "Silent majority weren't keeping quiet anymore". The inclusion of the phrase may have been inspired by Agnew's earlier use of it, as the song is a political allegory for the oppressed rising up against those with wealth and power who were suppressing them. Nixon's silent majority referred mainly to the older generation (those World War II veterans in all parts of the U.S.) but it also described many young people in the Midwest, West and in the South, many of whom eventually served in Vietnam. The Silent Majority was mostly populated by blue collar white people who did not take an active part in politics; suburban, exurban and rural middle class voters. They did, in some cases, support the conservative policies of many politicians. Others were not particularly conservative politically, but resented what they saw as disrespect for American institutions. According to columnist Kenneth Crawford, "Nixon’s forgotten men should not be confused with Roosevelt's," adding that "Nixon's are comfortable, housed, clad and fed, who constitute the middle stratum of society. But they aspire to more and feel menaced by those who have less." In his famous speech, Nixon contrasted his international strategy of political realism with the "idealism" of a "vocal minority." He stated that following the radical minority's demands to withdraw all troops immediately from Vietnam would bring defeat and be disastrous for world peace. Appealing to the silent majority, Nixon asked for united support "to end the war in a way that we could win the peace." The speech was one of the first to codify the Nixon Doctrine, according to which, "the defense of freedom is everybody's business—not just America's business." After giving the speech, Nixon's approval ratings which had been hovering around 50% shot up to 81% in the nation and 86% in the South. In January 1970, Time put on their cover an abstract image of a man and a woman representing "Middle America" as a replacement for their annual "Man of the Year" award. Publisher Roy E. Larsen wrote that "the events of 1969 transcended specific individuals. In a time of dissent and 'confrontation', the most striking new factor was the emergence of the so-called 'Silent Majority' as a powerfully assertive force in U.S. society." Larsen described how the silent majority had elected Nixon, had put a man on the moon, and how this demographic felt threatened by "attacks on traditional values". The silent majority theme has been a contentious issue amongst journalists since Nixon used the phrase. Some thought Nixon used it as part of the Southern strategy; others claim it was Nixon's way of dismissing the obvious protests going on around the country, and Nixon's attempt to get other Americans not to listen to the protests. Whatever the rationale, Nixon won a landslide victory in 1972, taking 49 of 50 states, vindicating his "silent majority". The opposition vote was split successfully, with 80% of George Wallace supporters voting for Nixon rather than George McGovern, unlike Wallace himself. Nixon's use of the phrase was part of his strategy to divide Americans and to polarize them into two groups. He used "divide and conquer" tactics to win his political battles, and in 1971 he directed Agnew to speak about "positive polarization" of the electorate. The "silent majority" shared Nixon's anxieties and fears that normalcy was being eroded by changes in society. The other group was composed of intellectuals, cosmopolitans, professionals and liberals, those willing to "live and let live." Both groups saw themselves as the higher patriots. Nixon's polarization survives today in American politics. According to Republican pollster Frank Luntz, "silent majority" is but one of many labels which have been applied to the same group of voters. According to him, past labels used by the media include "silent majority" in the 1960s, "forgotten middle class" in the 1970s, "angry white males" in the 1980s, "soccer moms" in the 1990s, and "NASCAR dads" in the 2000s. 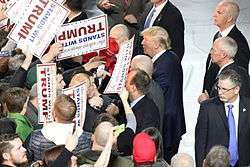 Donald Trump and supporters attend a rally in Muscatine, Iowa in January 2016. Multiple supporters hold up signs, which read "The silent majority stands with Trump". In 1975, in Portugal, then president António de Spínola used the term in confronting the more radical forces of post-revolutionary Portugal. The phrase "silent majority" has also been used in the political campaigns of Ronald Reagan during the 1970s and 1980s, the Republican Revolution in the 1994 elections, and the victories of Rudy Giuliani and Michael Bloomberg. The phrase was also used by Quebec Premier Jean Charest during the 2012 Student Strike to refer to what he perceived as the majority of the Quebec voters supporting the tuition hikes. The term was used by British Prime Minister David Cameron during the Scottish independence referendum, 2014; Cameron expressed his belief that most Scots oppose independence, while implicitly conceding they may not be as vocal as the people who support it. During Donald Trump's presidential campaign, he said at a campaign rally on July 11, 2015 in Phoenix, Arizona that "the silent majority is back, and we’re going to take our country back", and has used it in other speeches since. Look up silent majority in Wiktionary, the free dictionary. ↑ "Silent majority" Cambridge Advanced Learner's Dictionary (1995), accessed 22/2/2011. ↑ Haub, Carl (October 2011). "How Many People Have Ever Lived on Earth?". Population Reference Bureau. Washington, D.C. Retrieved November 13, 2014. Updated mid-2011, originally published in 1995 in Population Today, Vol. 23 (no. 2), pp. 5–6. ↑ Greenough, James Bradstreet; George Lyman Kittredge (1920). Words and their ways in English speech. The Macmillan Company. p. 302. Retrieved April 15, 2010. 1 2 3 Safire, William (2008). Safire's Political Dictionary. Oxford University Press U.S. p. 660. ISBN 0-19-534334-4. Retrieved April 15, 2010. 1 2 Niles' weekly register. 40. May 1831. p. 231. Quoting New York Representative Churchill C. Cambreleng, first appearing in the New York Standard, May 12, 1831. ↑ "Gambetta". The Contemporary Review. London: Isbister and Company. 43: 185. February 1883. Retrieved April 15, 2010. Anonymous author signing as "A German". ↑ Buckley, Kerry W. (December 2003). "A President for the 'Great Silent Majority': Bruce Barton's Construction of Calvin Coolidge". The New England Quarterly. 76 (4): 593–626. doi:10.2307/1559844. ↑ Johnson, Dennis W. (2016). Democracy for Hire: A History of American Political Consulting. Oxford University Press. p. 15. ISBN 9780190272692. ↑ John Ayto (2006). Movers and Shakers: A Chronology of Words that Shaped Our Age. Oxford University Press. p. 151. ISBN 978-0-19-861452-4. ↑ Varon, Jeremy (2004). Bringing the war home: the Weather Underground, the Red Army Faction, and revolutionary violence in the sixties and seventies. University of California Press. p. 330. ISBN 0-520-24119-3. ↑ Hixson, Walter L. (2008). The myth of American diplomacy: national identity and U.S. foreign policy. Yale University Press. p. 251. ISBN 0-300-11912-7. ↑ Buchanan, Pat (October 2, 2014). The World Over Live. ↑ Safire, William (2004). Lend me your ears: great speeches in history (3 ed.). W. W. Norton & Company. p. 993. ISBN 0-393-05931-6. 1 2 Larsen, Roy (January 5, 1970). "A Letter From The Publisher". Time. ↑ Fraser, Steve; Gerstle, Gary (1989). The Rise and fall of the New Deal order, 1930–1980. Princeton University Press. p. 263. ISBN 0-691-00607-5. ↑ Chafe, William Henry (2009). Private Lives/Public Consequences: Personality and Politics in Modern America. Harvard University Press. pp. 262–263. ISBN 0674029321. ↑ Frick, Daniel (November 26, 2008). "Obama Defeats... Nixon?". Huffington Post. Retrieved May 31, 2013. ↑ "The Nixon Tapes Unleashed – Manipulative Master Politician". The Seattle Times. November 9, 1997. Reprint of the Washington Post report by Walter Pincus and George Lardner Jr.: "Kennedy, Muskie, Jackson Eyed for Nixon Dirty Tricks in '71"
↑ Black, Conrad (2007). Richard M. Nixon: A Life in Full. Perseus Books. pp. 658, 764. ISBN 978-1-58648519-1. ↑ Luntz, Frank I. (2007). Words That Work: It's Not What You Say, It's What People Hear. New York: Hyperion. pp. 199–200. ISBN 978-1-4013-0308-2. ↑ In French: «Jean Charest interpelle la majorité silencieuse». ↑ Ross, Jamie (3 July 2014). "Scottish independence: Who is Scotland's 'silent majority'?". BBC News. BBC. Retrieved 3 July 2014. ↑ Fandos, Nicholas (11 July 2015). "Donald Trump Defiantly Rallies a New 'Silent Majority' in a Visit to Arizona". New York Times. Retrieved 7 September 2015. Perlstein, Rick (2008). Nixonland. Scribner. ISBN 0-7432-4302-1.